I've been plugging away at my tumblers a bit recently. Don't they look so pretty pinned up on the wall? I have a bunch of them cut out, so I'll keep going. It's a hand piecing project, that means I won't be done any time soon! Aren't they just meant to be together? I'm really pleased with the combination now. As soon as I saw the fabric those weeks ago I just had to have some, and now I'm thinking it must have been a premonition. Happy days, I can't wait to get busy sewing!! Sounds ominous doesn't it? But it's not so bad ... unless I decide I want to reattach the border print to the Montmellick quilt ... because I've made it into table runners already! On Monday last week, some of my guild buddies and I made a trip to Umbrella Prints. We've been wanting to visit with them since they were visitors at guild last year. They have a fantastic studio space, and they share with Nest Studio which runs art classes for kids. The Umbrella Prints girls are just darling, and we had a great time with them - I just adore their fabrics which are organic cotton and hemp. I love that being part of guild has expanded my horizons in the quilting world - it wasn't so long ago that I would never have heard of them in my own quilting circles, and though I'm still a vintage girl at heart, I'm already imagining ways I'll be able to use their prints in my own work. The big heart print you see there is what drew me in when they visited at guild. The shop that was visiting on the same night had a wrap skirt made in this fabric, and I snapped up the pattern immediately. The fabric was not available at the time, but I knew I'd have to make some mine in the future. Another thing that drew me in, and I just had to take home for the nostalgia value was the wooden mushroom knitting nancy. Do you remember doing tomboy stitch when you were a kid? I made miles of it ... I wonder whatever happened to it all?? And lastly from that outing, I just thought I'd share some painting tips that were on the blackboard in the art studio - hints that are relevant for quilting too, don't you think?? Holly is hiding under my quilt which is hanging in the dining room ... I'm sure she thinks she's completely invisible!! 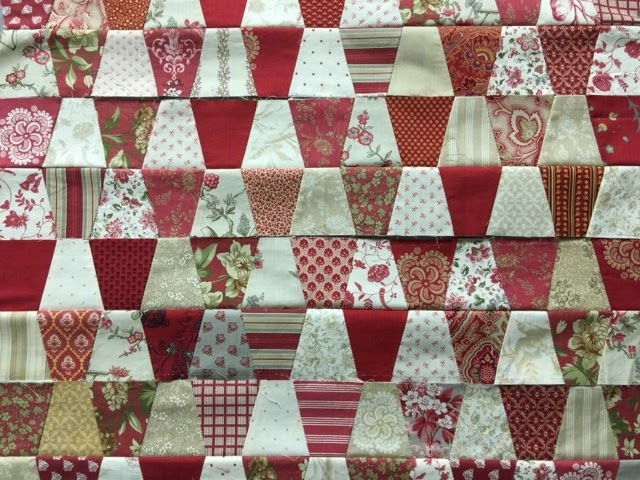 And for the absolute final thing ... when you have a chance, do pop on over to Sue Garman's blog, In addition to the fabulous eye candy that she always shares, this month Sue has also shared an excellent tutorial on binding your quilt. She binds the same way I do, but also takes some extra steps to make the binding super professional looking. Definitely worth checking out.